English Wiz is a unique and innovative program. It is the leading English Language software dedicated to helping Canadian Secondary School students of all levels build up the skills they need in class. English Wiz helps you to write with improved grammar, correct spelling, proper punctuation and more interesting sentences. All tutorials have recorded commentaries to help your children understand and make learning more enjoyable. Secondary students tend to struggle with tasks given for English homework because they have never really been taught how to do a comprehension task. How can you write about a news item in the paper, when your comprehension skills are not strong and the subject and vocabulary are unfamiliar? We introduce students to comprehension with anecdotes about familiar situations, so that they can develop their skills within their comfort zone. Oddly enough, grammar exercises are often not covered in the secondary school curriculum, yet students are penalized for bad grammar in essays. 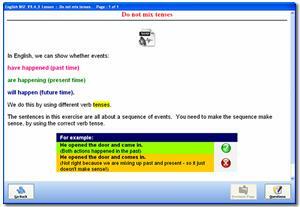 English Wiz helps you avoid commonly made mistakes. The Upper Secondary section in the English Wiz Series from Grade Aid Learning is designed to bring your child's writing skills up to the standard required to succeed in Senior School. The emphasis is on achieving a high standard in writing and comprehension skills. We are now applying the skills touched on in the Lower Secondary program, to more demanding situations. The student is asked to listen to the teacher, and think carefully about the exercise. Lessons are still in the same easy to use format, but are at a higher level with an emphasis on understanding the structure of language. This helps with writing essays and text analyses. In school, marks are lost if grammar and writing style are not up to standard. Very extensive reporting is available - your child's results are automatically recorded and kept permanently on your computer. English Wiz displays an analysis of all results.